I'm a sucker for a fancy hand wash. I just can't help it -- I see one, I have to have it. So is it any surprise that I've fallen head over heels for Crabtree & Evelyn Lily Conditioning Hand Wash? I've long been a fan of the fresh scent of lilies, so this hand wash really called to me from the start. It's light, crisp and feminine. Plus, it works up into a wonderful lather with only one pump, thanks to extracts of lily of the valley, peony, white magnolia and elderflower. And while I normally would decant my hand wash into a dispenser, the bottle is so beautiful and the pale green hue so eye-catching that I just have to leave it be on my bathroom sink! 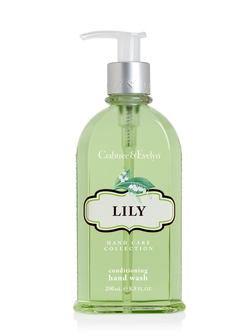 Crabtree & Evelyn Lily Conditioning Hand Wash retails for $18 at crabtree-evelyn.com.